Happy New Year! Traditional First Hike of the New Year! 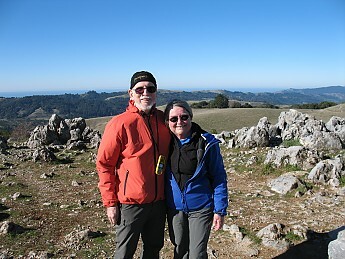 At the summit of Black Mountain, in the Santa Cruz Mountains. We take a New Years Day hike on January 1 of almost every year. This is almost astraddle of the San Andreas Fault. If you look carefully, you can see the Pacific Ocean in the background on the right, just above the distant hills. Round trip distance 10 miles, cumulative gain 2620 feet, summit temperature 44°F, wind 10 knots, wind chill 33°F. Note the Trailspace beanie! These annual hikes always have lots of friendly hikers on the Rhus Ridge/Black Mountain trail, meeting old friends and new. One of our new friends is a sports arena landscaper, who is responsible for redoing the Levi Stadium surface before every event. Another has lived on the road that leads to the parking lot (usually filled to overflowing) almost all his life (his parents have owned the house for something over 50 years). Meeting and talking with all these people slowed us down a lot from usual - it took 5 hours car to car. I wanted to do a trip on New Years day but it has to wait a few days. Nice photo Bill, Happy New Year to you both! Topic: Happy New Year! Traditional First Hike of the New Year!